NUSA DUA is the perfect place for you to relax and unwind under the tropical sun. The atmosphere of peace and quiet for your vacation in Bali is really satisfied here. Beautiful beach with blue sea, cool gusts of wind, the water was clear and calm, more white sand, and the scenery is very charming. 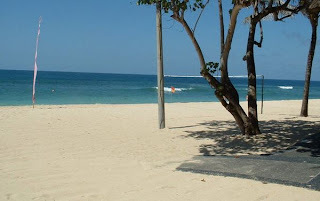 Because of its location at the tip of Bali, the beach is more quiet than other beaches in Bali. 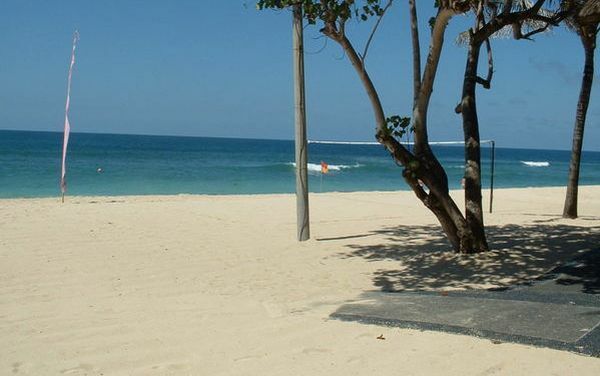 It makes Nusa Dua Beach feels more private and exclusive. Nusa Dua name comes from the name of two small islands in the southern island of Bali that are separated by white sand. Nusa means island and two means two. Two barren island is still left with no building experience and become one of the places tourists visit. Coast tourist area of ​​Nusa Dua Bali is also known as a tourist area that care about the environment and making it first in the Asia Pacific region who get Green Globe, the certificate given by the evaluator Evaluate Communicate Evolve for eco-friendly attractions. Concern for the environment has been planned from the beginning in this area with the hotel water waste treatment system processed for irrigation and irrigation. Central wastewater treatment station is named "eco lagoon." Infrastructure of water networks, electricity, and telephone use underground installations to maintain the beauty of Nusa Dua. Even the garden lights that automatically turn on bertenagakan solar panels. All hotels in Nusa Dua area is built does not exceed the height of a coconut tree or a maximum of 3-4 floors. Hotel Nikko can be constructed fifteen floors because the building follow the contours of the cliff with a height reaching approximately 70 masl. Privileges Beach Nusa Dua area of ​​approximately 350 hectares is enriched by a variety of exclusive amenities. Nusa Dua is an enclave containing a large international 5-star resort. Called exclusive because in this area there are all the things that needed to be a tourist place, such as beach complete with water sports, fine dining restaurant with full menu varied, and do not miss class hotel is very comfortable. You can breathe in fresh air from the palm trees and flowers around the region. Nusa Dua is situated on the southeastern most tip of the island about 15 km from Bali International Airport and about 40 km from Denpasar. Offering for your luxury resort is supported by the crystal clear sea and white sandy beach that complement the diverse tourist facilities. Hotels, restaurants, bars, until the shops here are generally high-class and have prices that reflect the status. Nusa Dua was originally developed by the BTDC (Bali Tourism and Development Council) is a private entity to develop the area of ​​Nusa Dua. Previously, this region is just the natural expanse of dry land non-productive until later acquired by the government in 1970 and then developed into a tourism project with a classy design a comprehensive and integrated as a cultural tourist resort. The government set a French consulting company, namely Société Centrale pour l'outre-Mer Touristique equipment (SCETO) to formulate the master plan for development of sustainable tourism in Bali. SCETO plan proposed complex in the seaside resort of independent, separate from the main population centers to minimize the impact of tourism on Balinese culture. This is one of the unique tourist resort of Nusa Dua, which is built separately from the Village Bualu as the primary location of this resort. Resort to the concept of cultural tourism is getting a degree as one of the 6 best resorts of the world. This place has ever hosted the UN Conference on Climate Change 2008.